4 Days Fez Merzouga desert tour departure will be at 8 O’clock in the morning toward a magnificent mountain village “Ifrane”, which also called The Switzerland of Morocco, and Midelt. We will see the middle and high mountains, and stop in a Berber village at Azrou to have lunch, and explore the largest and the famous Moroccan cedar forest, where you can see Barbary Macaque of Azrou, and spend the whole afternoon. At the end of the day, we will reserve in a Hotel, where we will provide you with the best service, and where you will have dinner and spend the night. After taking your breakfast, we will drive to Merzouga, passing by Errachidia, with fascinating views across the road, the Tizi-N-Talghemt pass, the Ziz Gorges, and while approaching Errachidia city you will gradually notice parts of the desert. At Errachidia, we will have lunch with a Berber family, you will certainly fall in love with their hostility and simplicity, then we will continue to visit the luxurious Ziz valley. We will continue after that; to Merzouga while stopping along the way to Erfoud to enjoy the beauty of the views. 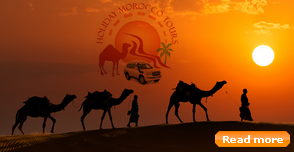 Arriving at Merzouga, we will check in a hotel, and then get prepared for a camel trekking over the golden dunes, to fully enjoy yourself in the charming beauty of the Sahara Desert in the 4 Days Fez Merzouga desert tour.Then, we will come back to the hotel to have dinner and spend a night there. We will have an exploration walk in the area after having breakfast, by visiting the nomad’s goat hair yurts, to learn more about the life in the desert, and to meet “Gnaoua”, who were originally slaves brought from Sudan, to listen to their lovely piece of music that you will certainly love, and dance according to its rhythm, also it will be a good opportunity to get an idea of their culture as well as their lifestyle. We will visit the lake of Merzouga, known for its large quantity of birds, and which also called “The flamingos”. In the late afternoon, we will drive to our camp at Erg Chebbi Dunes, to take some rest, and have dinner served with a cup of Moroccan mint tea. You can feel free either to spend the night under the stars in front of the camp or entering the Berber yurts. Try waking up early in the morning to watch a magnificent scene of the sunrise shadows over the dunes near the camp. We will pass by Ziz valley, the middle Atlas mountains, and Azrou to go toward Fez at the end of 4 Days Fez Merzouga desert tour, and then we will drive you to a hotel of your choice.